Sometimes I like to put a decoration on my zipper pull. When I was making zip pouches regularly for sale at craft markets, I rarely put any decorations on zipper pulls. This was because it's hard to predict what turns people off. I still remember my early days of selling at craft market. One lady asked me to cut off the zipper pull decoration because SHE HATED IT. Well, since she paid for it, she's entitled to do whatever she wants. (But couldn't she quietly cut it off herself at home?) There were other occasions when customers would say things like, "oh, I would buy the zip pouch except for the THING on the zipper." At this point of the story, you probably think I must be pretty bad at zipper pull decorations and should stop making them. Well, I actually never thought that at all. But it did occur to me that I did not have a clue what kind of zipper pull decorations people like. And that's why I stopped putting decorations on zipper pulls of items I make for sale. And I still don't have a clue. But if the item is for myself, then of course I get the privilege of deciding what kind of decoration goes with my zip pouch. I think that's the best benefit of being a MAKER. 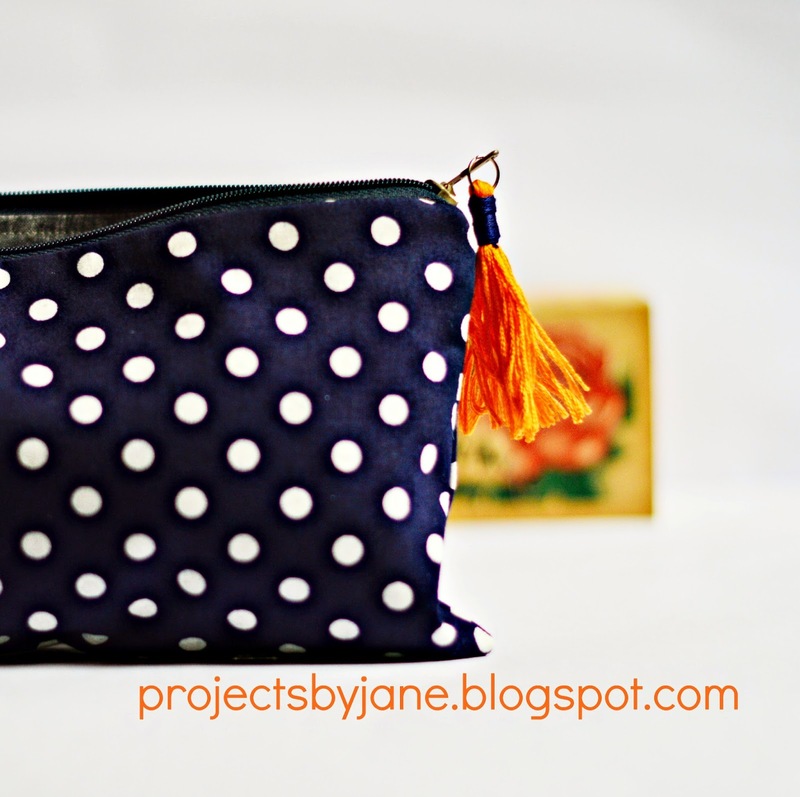 For this simple blue and white polka dot zipper pouch, I added an orange tassel for a pop of colour. 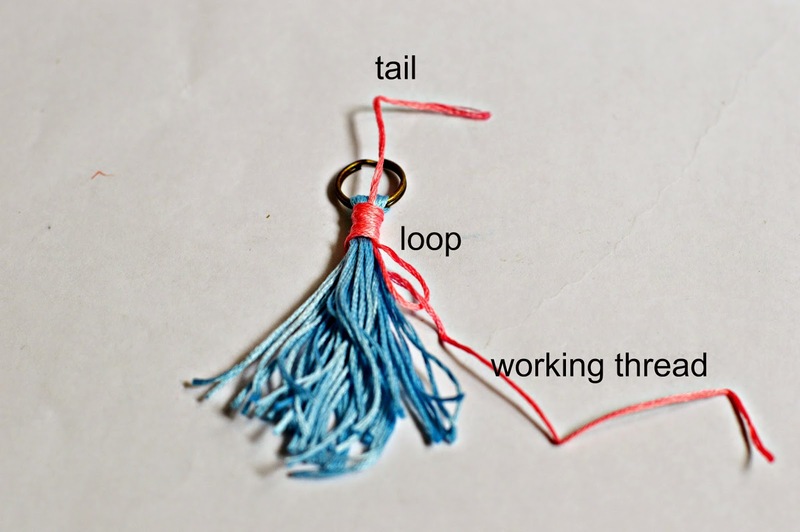 Here's how you make a tassel for a zipper pull. 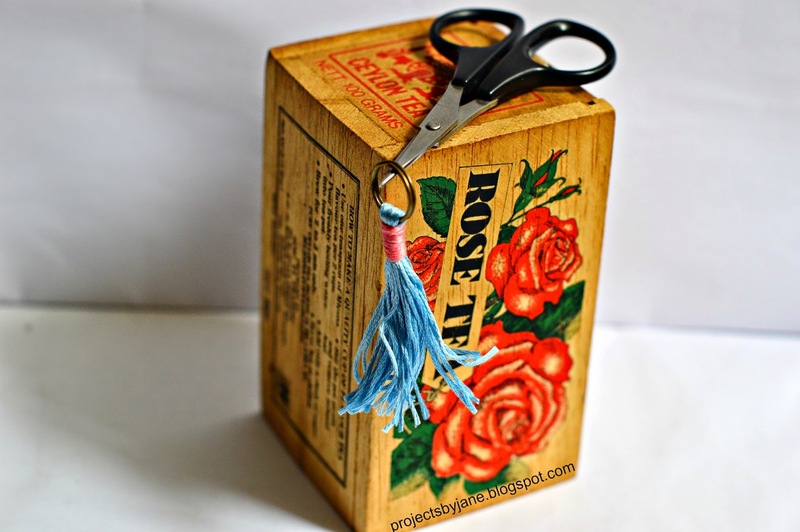 Step 1: To get a tassel around 2.25" long, cut a piece of stock card 2.5" tall. 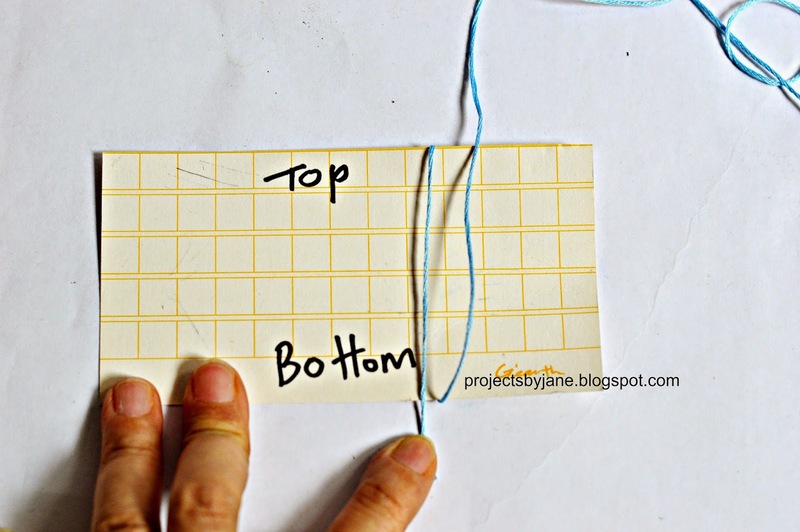 Step 2: Wind your tassel thread round the stock card. Count each round as going from the top round the back, up the front to the top again. For my tassel, I made 20 rounds. You can make more rounds if you like. 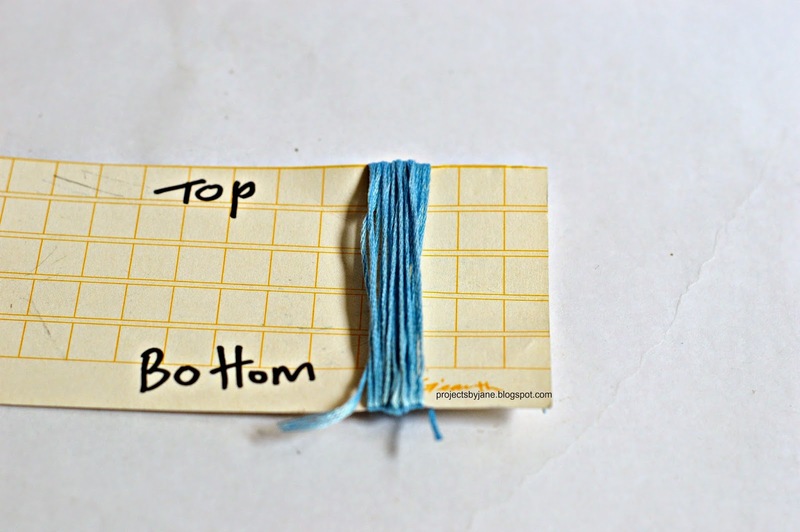 Step 3: Cut the threads at the bottom of the stock card. 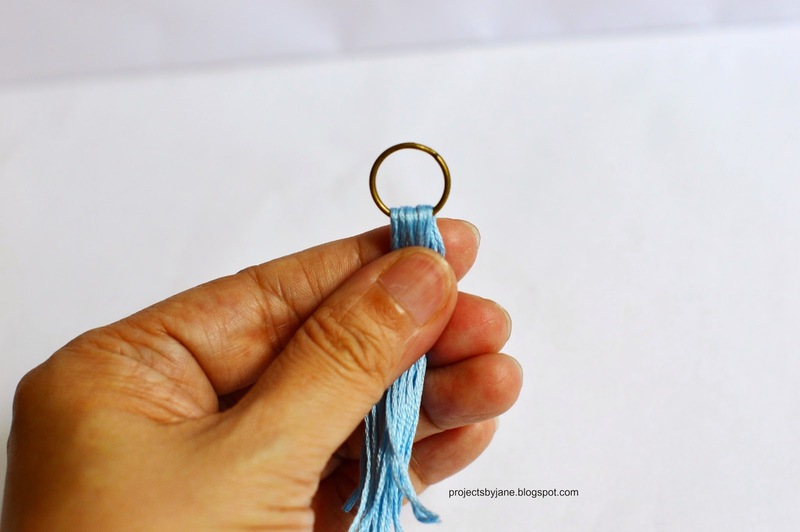 Step 4: Carefully place thread through split ring/jump ring. Step 5: We want the ring to sit right in the middle. Step 6: You need around 18" of thread for securing the tassel. 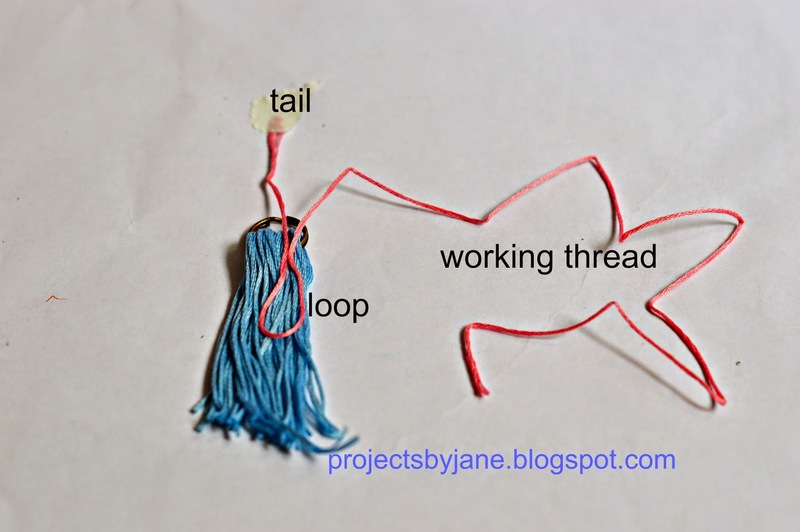 Here I'm showing how to place the tail and the loop because this is going to help hide your threads later on. 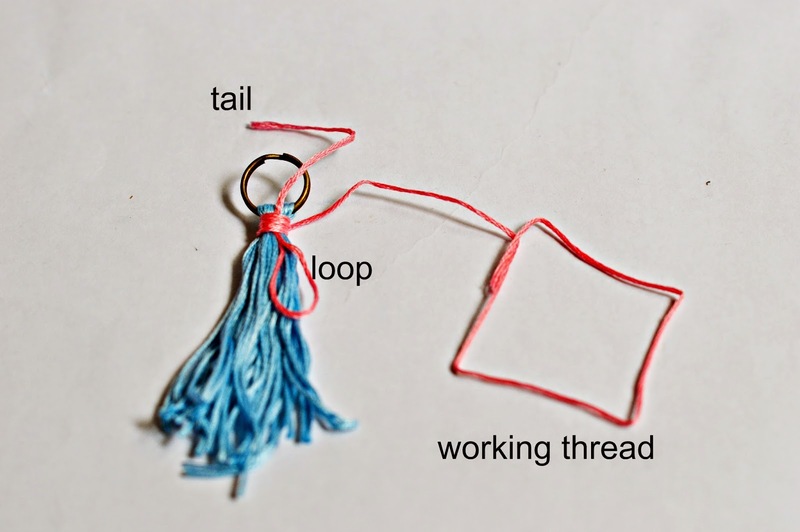 The working thread is the part of the thread you use to wind round the tassel. Step 7: Now you need to wind the working thread over the loop and tassel. You need to keep the tail and loop out of the way. 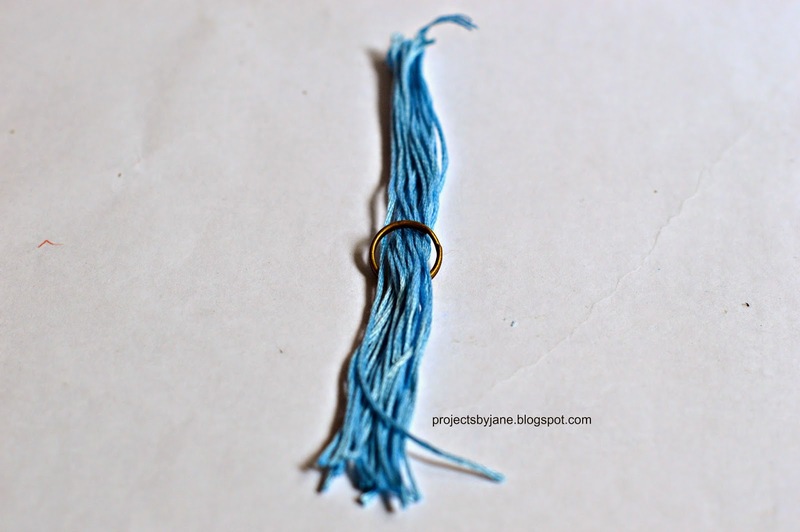 Try not to wind the thread over the same position over and over or you will get a bulky mess. 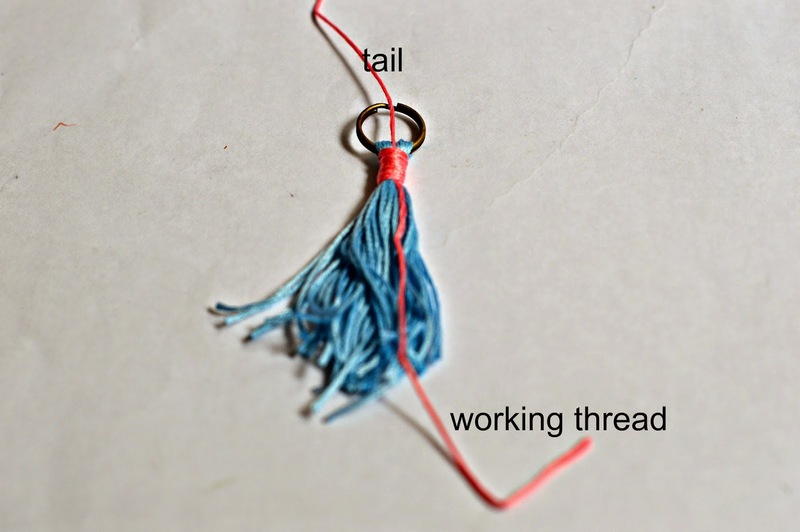 Step 8: When you're satisfied with how the tassel looks, put your working thread through the loop. Step 9: Pull on the tail and it will bury the loop inside the thread. I would also pull on the tail and working thread at the same time just to make sure everything is secure. Snip off the tail and working thread as close to the binding as possible. 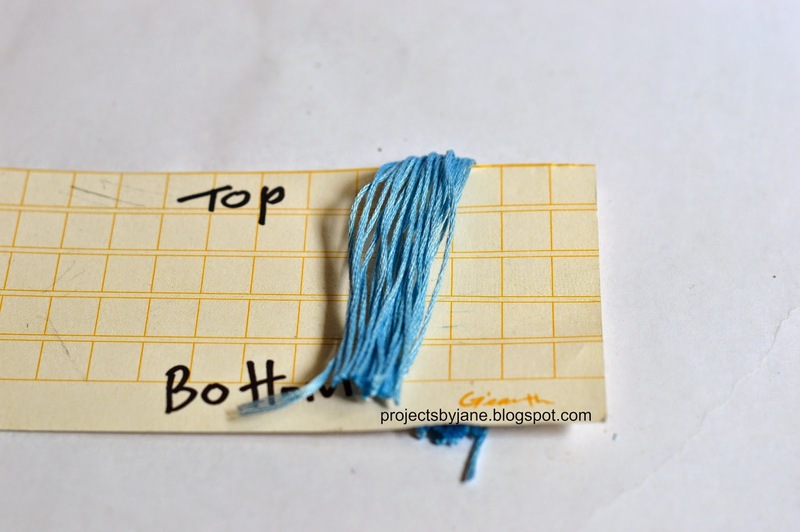 Trim the ends of tassel until you are happy with it. And you have a zipper pull decoration. What do you think? Is this something you will make for your zippers? I like attaching small charms or key chains to my zipper pull (for pouches/pencil case), cause it is it easier to pull the zippers that way. And thanks for teaching us how to make a tassel! ^^^ Yes - exactly what Christel said! I love adding charms to zippies - as Christel says, it makes them easier to open, but I think it also gives them a more finished look :) Kinda dickish of that lady to ask you to remove a zipper pull for that reason though - what a diva, LOL! Christel, I will do a post on charms for zipper pull next! I like your zipper pulls! I'm going to bookmark this and try it on my next pouch. I have seen these popping up now!!! This is awesome bc I want to make some!!! thanks for the tutorial! Perhaps you could create a basket full of zipper charms and mention that customers are free to choose their own charm/tassel with each purchase of a zip pouch. Most people like getting something for free and they go away feeling like they've gotten an extra bonus with their purchase. Win-win for you and them. BTW... 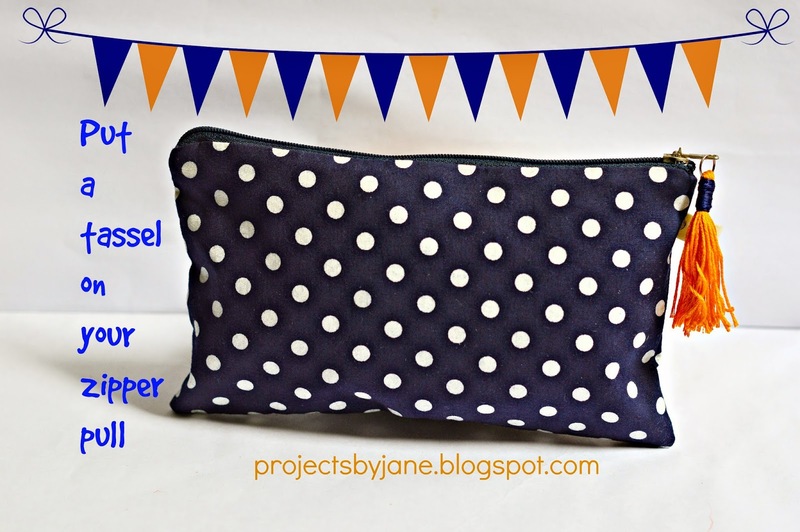 I love your orange tassel and that black polka dot bag.